Tetris has been released in all sorts of forms, and now you can slip it into your wallet! Being a big fan of video games, I've played Tetris on just about every gaming hardware under the sun. These include platforms from Nintendo, Sony, and Microsoft, among others. I’ve even played Tetris in the arcade, on my phone, and on a watch! All of these iterations of Tetris brought me countless hours of fun. While I thought I’d seen it all, I was quite wrong. A couple weeks back, I had my eyes opened to a new way to experience Tetris. Believe it or not, you can enjoy a game of Tetris on a device the size of a business card. Known as the Tetris MicroCard, the device allows you to comfortably fit a game of Tetris into your wallet. This is something I never imagined possible. The Tetris MicroCard has officially become my latest Tetris obsession. One of the most amazing things about the Tetris MicroCard is the size of the device itself. Hearing the device is the size of a business card is one thing, actually seeing and holding it in person is another. To tell you the truth, it's a mind-boggling experience. I'm someone who first enjoyed portable Tetris through the Game Boy (which was a pretty chunky device, even back in the day). Still, having Tetris on-the-go was something we were all wowed by. 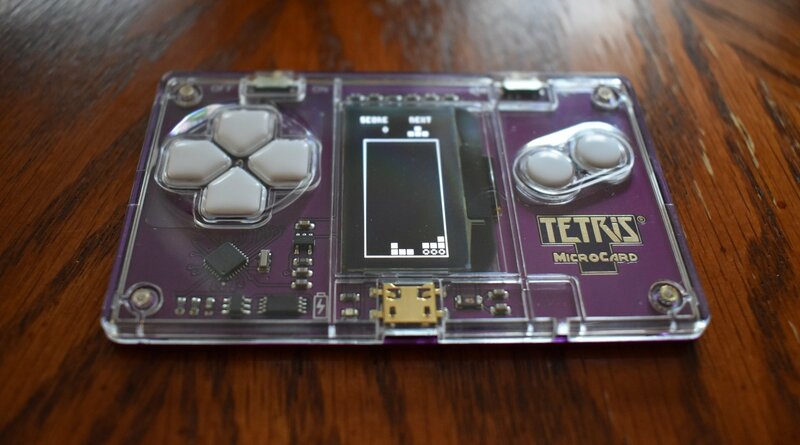 Now with the Tetris MicroCard, we can play Tetris on a ridiculously tiny piece of hardware, and the experience is equally as impressive as it was during the Game Boy years. Another thing to note is that the build quality of the Tetris MicroCard is top-notch. While the device has the profile of a business card, it certainly doesn't have the feeling of one. This is a sturdy device with a slick-feeling metal casing and a smooth plastic cover on the front. You also get physical buttons on the device, lending every game of Tetris on the MicroCard a wonderful, tactile feeling. I still have a hard time wrapping my mind around how such a high-quality product was crammed into a ridiculously small form factor. As for the Tetris game itself, the Tetris MicroCard provides you with quite the experience. Because the screen is high contrast, you'll have no problem playing in either complete darkness or the bright sun. 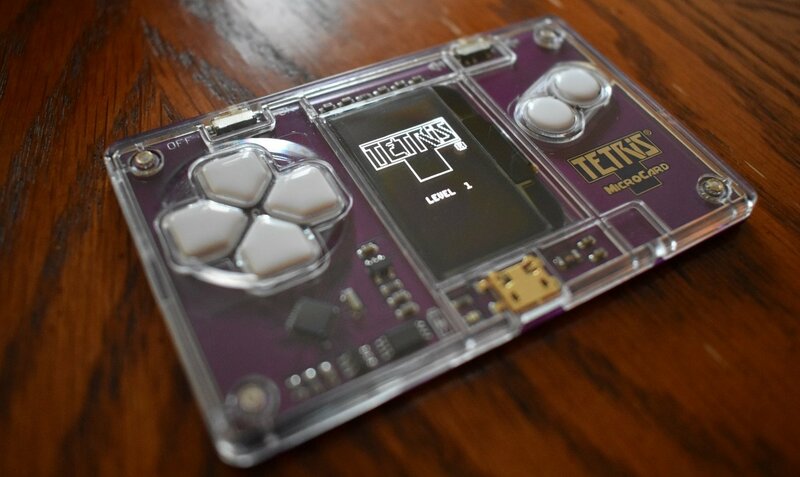 Furthermore, the Tetris MicroCard has a black background with a white Tetris Matrix and white Tetriminos, giving everything a cool, retro feel. The Tetris MicroCard is decidedly old-school in how it handles as well, especially considering it boasts no Hold Queue. Ask nearly any Tetris fan, and they’ll tell you that the Hold Queue is something they’ve really become accustomed to! With the Tetris MicroCard, you’re offered a unique challenge. Can you find a place for every Tetrimino that falls through the Matrix? The Tetris MicroCard is cool in so many different ways, and the device always wows people when you first show it to them. It's something you simply can't look away from. Then, once they play, you can bet it's hard to get people to give it back! Everyone quickly gets sucked into that Tetris gameplay, and can easily spend hours playing. The Tetris MicroCard keeps track of high scores as well, which has already become an obsession of mine. I've been passing the device around with friends and family, and we're all out to take the top of the leaderboard. I happen to be sitting in first place right now, and I'm feeling pretty good about it! I think my reign is going to be a long one, but if I ever get knocked from my throne, I'll be ready to jump back in and reclaim my rightful spot atop the competition! If you're looking for another excuse to play Tetris, you can’t go wrong with the Tetris MicroCard. It's expertly crafted and supremely engaging. It's definitely a Tetris experience you can take anywhere and enjoy for quick bursts. For me, it's a device I always have at my side, and play it way more often than I should! It's that much fun, and I'm always eager to get back for one more round. Planning to order a Tetris MicroCard? While you wait for it to ship, why not play some Tetris for free on Tetris.com?